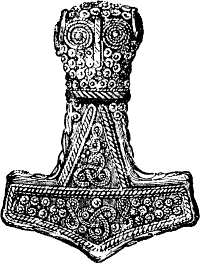 June 17, 2014 /32 Comments/in Featured Articles, Western Culture /by Andrew Joyce, Ph.D.
Mjolnir, the hammer of Thor; one of the major symbols of Ásatrú. Thomas Carlyle, Lectures on Heroes, 1841. I come from a long line of atheists, heretics, and breakers of convention. I’m sceptical about anything related to what’s considered the paranormal or supernatural. I don’t think I’ve ever held an honest religious belief. I consider myself, above all, to be an ardent rationalist. I look for facts, I weigh evidence, and I attempt to come to measured conclusions. Despite this, I’ve never had a problem with religion qua religion. I like the idea that there is more to our existence than what can be seen, and I am happy for any collection of sky-searchers to worry about my soul so long as those who believe in their chosen deity or deities refrain from interfering in my “real” interests. A Muslim in Riyadh can dictate to the females around him as he pleases; it doesn’t concern me. It does concern me, however, when that Muslim wishes to import his beliefs and attending actions (not to mention about one hundred equally ‘pious’ relatives) into my locality. Closer to home, I can’t say I’ve had much of a problem with Christianity among my fellow Whites. In fact, I have a number of Christian friends; as a group they’re a polite bunch, and normally seem quite cheerful. A few of them had struggled with depression and myriad social difficulties until they “found Jesus,” so perhaps there is something to be said for the palliative benefits of that faith; and perhaps this explains, more than any other fact, its endurance and appeal in all ages. However, controversial though it may be to say it, it occurs to me that Christianity is coming more and more into conflict with what I perceive to be my interests and those of my ethnic group. Curiously, for a religion which grew like a weed from the rabidly ethno-centric soil of Judaism, Christianity has been anything but a friend to the ethnic group which breathed life into it, energized it for centuries, and took it to the four corners of the earth. The source of almost unceasing fratricidal conflict for centuries, the Church now reveals itself a party to the abolition of the European peoples. In the past, when Europe, North America and other White nations were ethnically homogenous (and confidently so) some of the fundamental conflicts between ideas of the “universal man under God,” and an acknowledgement that one was part of a specific ethnic community with concrete interests, could be masked. Not so in this brave new world. Only since the 1950s can we assess the utility of the Christian faith in acting as a boon to the folk who for centuries granted it lordship over them. And in the assessment of this writer, it has been found wanting. The National Front was deemed un-Christian because its manifesto articulated that: “The National Front is the movement of British Racial Nationalism. It is committed to preservation of the national and ethnic character of the British people and recognises that the nation must be exclusively of European and predominantly British racial descent.” This was simply too much for the Church of England, which apparently cares for the ‘souls’ of the British, but not for their right to avoid extinction. The Church seems oblivious to the fact that demographic change will result in it too going the way of the dinosaurs, since the rapidly rising Muslim population of Britain is going hand-in-hand with the conversion of churches to mosques — mirroring a development across Europe. Although I’ve just mentioned one example here, the betrayal of White Christians by their religious leaders and organizations on the subject of race and immigration is widespread. Furthermore, as the TOQ special issue on White pathology showed, any treatment of White pathology cannot avoid the central role of Christianity in the 19th-century moral movements which gradually ate like a cancer into such robust bodies as the British Empire. Despite the seriousness of the problem, as a movement and a community, we in White advocacy more often than not avoid giving it the attention it deserves. Some of the reasons for this are obvious. Religion is something many people take very personally and very seriously — we don’t want to alienate any of those among us who may cherish certain beliefs. Additionally, as we struggle and fight for legitimacy in the mainstream, or even just for the visibility of our point of view, we hesitate to take on a subject or make criticisms which we know may bring us into conflict with vast numbers of our fellow Whites. But silence can’t obscure the fact that organized Christianity is, in theory as well as practice, currently opposed to the preservation of the European peoples. It opposes the very idea that Europeans conceive of themselves as a racial group with their own interests. In the view of the Church of England, and other major Christian bodies, Europeans are committing a “sin” simply by asserting that they are a member of a race with interests and ties of kinship, rather than some generic human vessel which houses a “soul” destined to enjoy a multicultural paradise in this life and the putative next. I find myself in the most vigorous opposition to this stance. Incensed and intrigued by the actions of the suicidal Christian Church, some time ago I began to do a little research on the subject of religion and the White advocacy movement. I eventually came across a far-from-perfect, but rather interesting, book titled Gods of the Blood: The Pagan Revival and White Separatism. Penned by Swedish academic, and self-styled “anarchist,” Mattias Gardell, the work looks at how White advocates of varying backgrounds have struggled with the problem posed by the failures of Christianity in this, our Age of the Deluge. These struggles have thrown up numerous viewpoints and alternative approaches to the issues of faith. At the opposing end of the spectrum from Metzger are those who believe that religion is of key consequence for the future of the European peoples. The religion of choice among this group of people appears to be Ásatrú, or Odinism. Considering myself an ardent rationalist and evolutionist I have to confess to having scoffed in the past at the idea of the continued practice of this ancient faith. Largely ignorant of what the practice of Ásatrú actually entailed, I tended towards agreeing with Klassen’s summation that Odinism was “a silly hangover from our Stone Age ancestors.” However, I try to keep an open mind and decided to do some research into both the ancient and modern practice of the religion. Although not straightforward, it’s worth attempting a useable definition of Ásatrú. Ásatrú literally means “faith of the Aesir” (Norse gods), describing a loose polytheism practiced in the Germanic northern regions before the coming of Christianity in the 9th century. As modern Ásatrú is a reconstruction of this faith, it is important to understand the components that comprise this reconstruction. What we know of old Norse religion comes primarily from the Sagas and the Eddas scribed in the 13th century by Christian monks. Officially the Northern lands became Christian around the year 1000; hence the legends and myths contained in these writings are largely the product of Norse Christian culture in Iceland and Norway. The most famous of these writings is the Prose Edda written by Snorri Sturluson (d. 1241). There are some archaeological finds that contribute to this knowledge, but it is primarily the Sagas and Eddas which inform the practice of Odinism today. However, there is more to it than that in Ásatrú today, especially in the growing racialist community of Ásatrú. Gardell defines Ásatrú as one of several modern “reconstructions” of ancient European religions, one that focuses on Norse and Germanic religions from ancient times. Further, Gardell describes this “racist paganism” as part of a “biologization of spirituality,” which is itself an outgrowth of Nationalist opposition to globalization. In ‘reconstructing’ Ásatrú, practitioners have acknowledged the necessity to emphasize existing facets that are particularly useful to modern Europeans. The most relevant of these facets is the central role Ásatrú afforded to the relationship between an individual and his kinsmen or ‘folk.’ It also places great emphasis on the acknowledgement of one’s ancestors and heritage, key components of the concept of peoplehood. Crucially, Ásatrú is connected to the past, but it is also deeply connected to a concept of biological taxonomy or race. In this it differs radically from Christianity. Gardell sees Ásatrú as “an earth-based polytheist ‘tribal’ spiritual worldview.” Examining Ásatrú from a strictly rationalist perspective, I couldn’t help be struck by one or two elements of its modern manifestation which, consciously or not, mirror Judaism. Both are, to a great extent, tribal religions which reject proselytizing outside the group. Ásatrú, like Judaism, is not a universalist faith and is concerned primarily with the well-being of the group. Gardell states that it is in “opposition to the global ambitions of Christianity as spiritual imperialism, Ásatrú has no missionaries and is generally hostile to the notion of universal religious truth.” Significant moral decisions are not based on abstract principles, but rather on what best serves the interests of the kinship group. Beyond these elements, differences between Ásatrú and Judaism reflect the differing natures and societies of the two peoples who developed them. I was struck by the lack of authoritarianism, and incredible fluidity in class barriers, in the Old Norse society and in the tenets and practice of Ásatrú. Indeed even the Norse pantheon, while honored, was never ‘worshipped.’ Unlike Judaism, Ásatrú has never been dogmatic, and this weakness undoubtedly left it vulnerable to the 10th-century encroachment of Christianity which carried a substantial Middle Eastern legacy of dogmatism and authoritarianism into Europe. Unlike the Jewish god, the Aesir were to be regarded more as “elder kin” than tyrants to be feared, and they reflected key aspects of contemporary Indo-European society in that they exuded an aristocratic air, scorned the vulgar, and were stridently anti-materialistic. These ‘gods,’ as C.G. Jung argued in his famed essay ‘Wotan,’ were to be seen less as independent transcendental beings, and more as exemplary models of consciousness, or archetypes, which serve as patterns for human development. The purpose of this essay has not been to attack Christianity qua Christianity, or to promote any particular faith or point of view. I should probably state that much as I admire aspects of Ásatrú I feel that it is “not for me.” Although I am not an Ásatrúan, I hope I have presented a balanced assessment of it here. I certainly view its continued practice as a valuable part of the cultural life of our people, and I highly esteem the protective concern it has for the ‘folk.’ Even the most hardened evolutionist will struggle to deny the ongoing influence of religion and religious ‘need’ among all peoples, including our own. This essay should instead be seen as an attempt to acknowledge some of the difficulties which continue to be presented by major Christian institutions in regard to issues of race and immigration, and some of the creative, earnest, and deeply felt attempts by some of our people to restore a kind of faith-life which is more conducive to our survival. M. Gardell, Gods of the Blood: The Pagan Revival and White Separatism (Duke University Press, 2003). The book was given a brief review by Robert S, Griffin in TOQ, Vol.7, No.1, 107-112. E. Fitch, The Rites of Odin (Llewellyn Publications; 2002), p.xxii. T.A. DuBois, Norse Religions in the Viking Age, (University of Pennsylvania Press, 1999), p.19. S.v. Schnurbein, History of Religions, Vol.45. No.2. (2005), 191-194.